Renovation of an old building provides an excellent opportunity to enhance the living environment while preserving a lot of the existing features. The charm of an old building is defined essentially by its unusual floor plans and traditional details, and these need to blend in stylishly with modern convenience. Thoughtful, selective bathroom renovation seamlessly integrates modern elements into the existing architecture – without involving any major structural work. 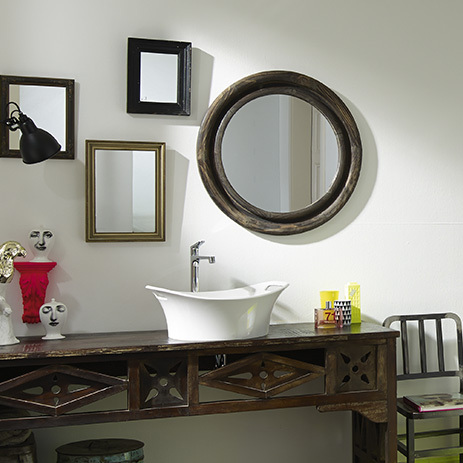 Original details such as parquet and homely materials can be combined with fresh design. An antique base unit takes on a whole new quality when you add state-of-the-art mixers. 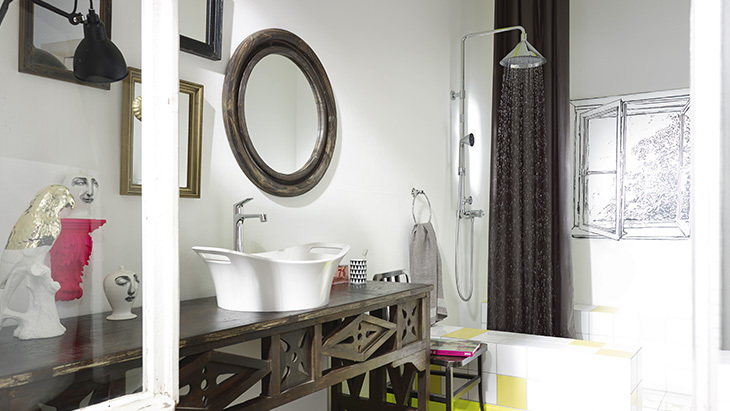 Alternatively, a wash bowl in contemporary design forms an appealing contrast with old collector's items. An old-fashioned bath tub can be stylishly complemented by a modern shower system, which also takes advantage of the ceiling height. You can pull off the combination of old and new very quickly and easily with showerpipes, making use of existing connections. 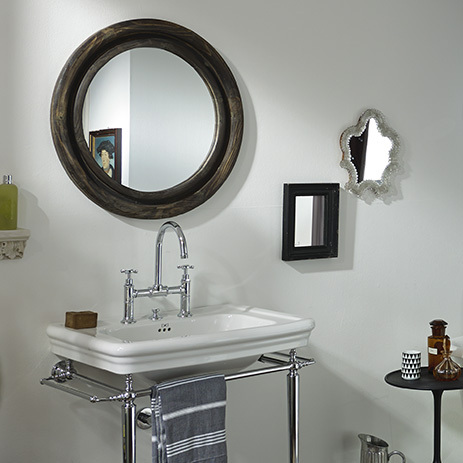 Small bathroom solutions gain space and appeal by opening up into other areas. Thus, in the floor plan shown above, only the small wall separates the shower area from the wash basin, while at the same time it offers a place to sit as well as shelf space. A textile curtain that fits in well with the character of the old building can be used as a decorative and practical element. 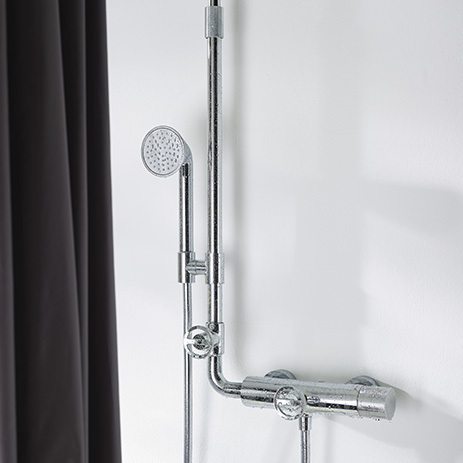 A showerpipe is a modern exposed installation system which, thanks to its universal design, fits in really well with a fusion of styles, both when it comes to the traditional bath tub and also the floor-level shower in the featured bathroom in the old building. The shower system blends in equally elegantly with the basin mixers and wash basin, which are in other styles. 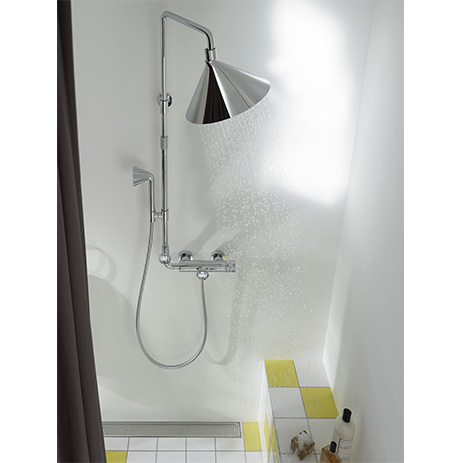 The renovation of the old building shown here was implemented using AXOR ShowerProducts designed by Front. Variants demonstrate how other AXOR products blend in smoothly with the existing features and set stylish, modern accents in the old building.